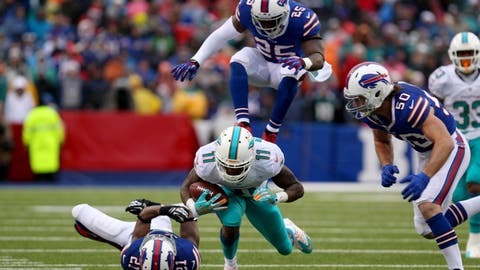 Dolphins wide receiver Mike Wallace runs the ball during the first half of Miami's loss to the Bills on Sunday afternoon. ORCHARD PARK, N.Y. (AP) — Left tackle Bryant McKinnie and the Miami Dolphins had trouble handling the Buffalo Bills’ blitz during the game. And McKinnie and company had difficulty coming up with answers afterward, too, following a 19-0 loss on Sunday that put a dent in the Dolphins’ playoff chances. "Um," McKinnie said, beginning to laugh uncomfortably when asked what went wrong, "I don’t know. I couldn’t tell you." The patchwork offensive line — the Dolphins’ season-long weakness — gave up a season-worst seven sacks and was part of a unit that managed just 103 yards and six first downs against an AFC East rival that had little to play for after being eliminated from playoff contention a week earlier. "I don’t know," added right tackle Tyson Clabo of a line that’s surrendered a franchise season-worst 58 sacks. "Obviously that wasn’t our goal to have that stat…"
The Dolphins (8-7) had a three-game winning streak snapped and are in jeopardy of missing the playoffs for a fifth consecutive season. With the loss, Miami needs help from other teams. Miami hosts the New York Jets next weekend. The Dolphins’ loss clinched the AFC East for New England. Buffalo’s blitz got to starter Ryan Tannehill on the third play from scrimmage. And the pass rush didn’t stop until he was sacked a final time on his second-to-last snap of the game. In closing their home schedule, the Bills (6-9) won consecutive games for the first time since Weeks 2-3 of last season. "That was a pretty good beating," Bills defensive coordinator Mike Pettine said. "They were flying around. They were getting off the ball and they just looked a step faster than Miami did all day." Veteran defensive tackle Kyle Williams and rookie cornerback Nickell Robey had two sacks apiece. Mario Williams, Jerry Hughes and Da’Norris Searcy added one each in helping Buffalo to its first shutout in over two years — and first at Ralph Wilson Stadium since a 21-0 win over Miami on Dec. 17, 2006. The seven sacks upped Buffalo’s total to 56 this season, breaking its previous high of 50 during a 14-game season in 1964. "It’s a nice consolation for where we are," Kyle Williams said. "I think you’ve seen today potentially what we can do." The defense took the burden off a depleted offense led by backup Thad Lewis starting in place of rookie EJ Manuel, out because of a swollen left knee. And the Bills’ offense finished without its top three receivers. Rookie Marquise Goodwin had a right knee injury late in the first quarter. Fellow rookie Robert Woods was ejected for punching safety Reshad Jones in the facemask in the third quarter. Veteran starter Stevie Johnson was excused to be with his family following the death of his mother. Dan Carpenter essentially sealed the win by hitting a 45-yard field goal to cap the Bills’ second possession. Carpenter finished hitting all four attempts against his former team, and Fred Jackson had 111 yards of offense, including a 9-yard touchdown. "I’m very proud of this team," rookie head coach Doug Marrone said. "It was an honor to be on that sideline and watch those guys perform." Lewis, who grew up in Miami, finished 15 of 25 for 193 yards and an interception. He improved to 2-2 this season, with both wins coming against the Dolphins. Miami crossed midfield only three times, converted just two of 14 third-down chances, and managed just six first downs, including two in the second half. Tannehill finished 10 of 27 for 82 yards and was briefly knocked out of the game with a left knee injury after Williams’ second sack early in the fourth quarter. Matt Moore took over and provided Miami a short-lived spark by completing a 50-yard pass to Brian Hartline. He followed by throwing an interception to Jim Leonhard. Though Tannehill said his knee’s fine, he wasn’t pleased with the offense’s outing. "It wasn’t one thing, it wasn’t one area," Tannehill said. "Every aspect of the game, we failed to step up to the plate." NOTES: The Bills have three players with at least 10 sacks — Mario Williams (13), Kyle Williams (10 1/2) and Jerry Hughes (10) — for only the second time since 1995. And they’re the first NFL team with three since the 2000 Saints. … The Dolphins were shut out for the first time since closing last season with a 28-0 loss at New England, and were swept by Buffalo. … Tannehill has 3,709 yards passing to move into 10th on the Dolphins’ single-season list. The top-nine spots are held by Dan Marino. … The Bills, under Marrone, matched their win total from last season under Chan Gailey.